Hi there!! I hope your weekend was wonderful. Well today my friends, I am certainly stepping out of the box. I'm presenting my first ever DIY here on the blog. You guys... I don't do DIYs. Ever. They intimidate me and I frankly don't have much patience for them. But lately I've been keeping up with Jenny Komenda's DIYs on her blog and gosh she has a way of motivating me! She recently purchased a new home and is doing one amazing DIY after another. She has inspired me. 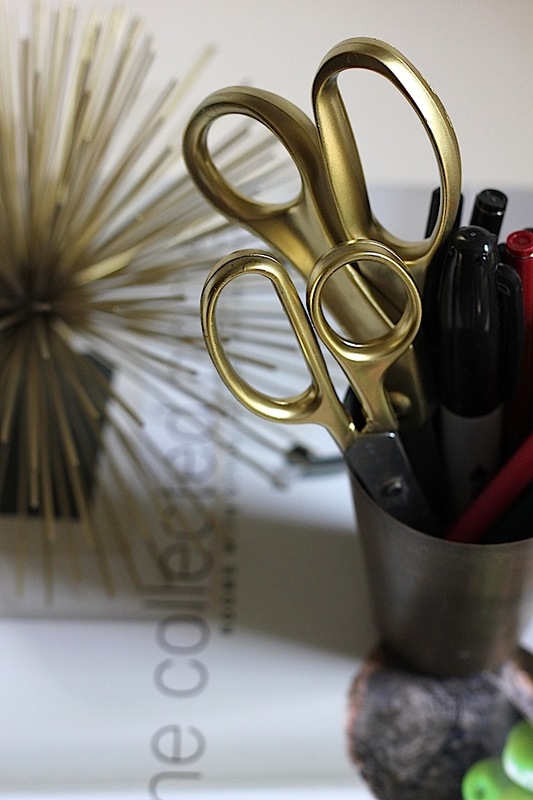 One of her DIYs was a pair of gold scissors for her new desk. 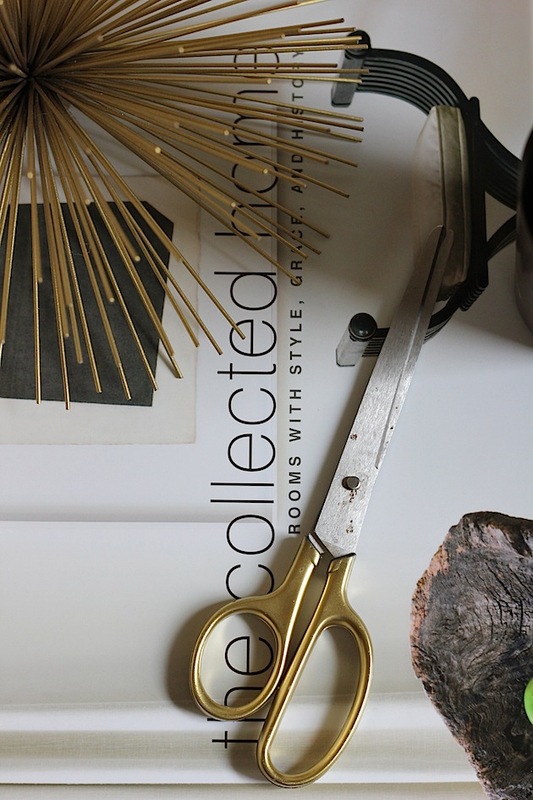 I've wanted a pair of gold scissors since I saw these at Restoration Hardware. They were super expensive, so I stopped thinking about them. But they quickly came back to mind when Jenny explained how easy and inexpensive they can be to make them on your own. So I tried it. And I'm so glad I did. It was so easy to do and I LOVE the way they turned out! You could always spray the entire pair of scissors, but I personally like the contrast of the gold and silver. If you prefer the same, then wrap the blades with the painters tape. Place the scissors on the newspaper and spray the first side with a coat of the spray paint. By the way, this is some GOOD spray paint. It coats beautifully, dries fast and doesn't have a strong smell once it dries. Love it. After the first coat completely dries (about 10 min), flip the scissors over and spray the second side. Let it dry. If you missed some spots on the first application, be sure the scissors are completely dry before applying a second coat. Once they are dry, remove the painters tape. That's it! I have been dying to do this simple DIY forever! I am going to Michael's today!! 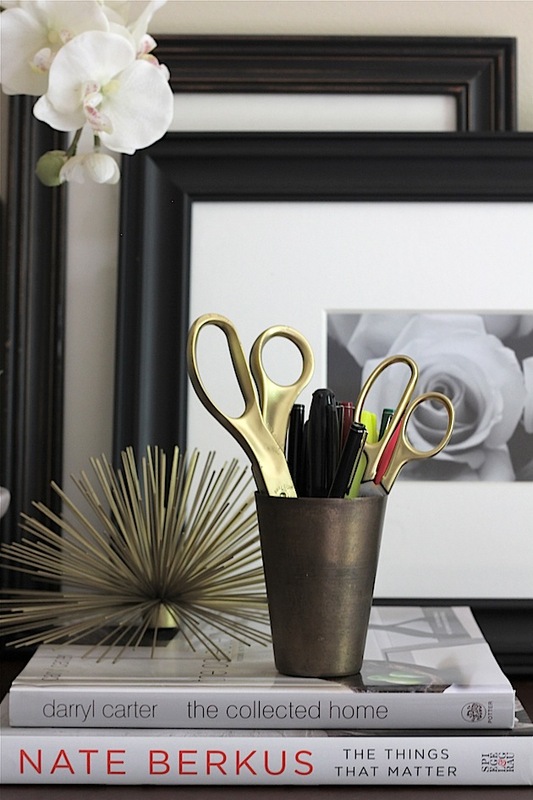 Love this idea of taking a boring old pair of scissors, and making them into a piece of art! My scissors will no longer be an eyesore! Thanks! But of course!! Genius! I'm doing this!! Whoa!!!! DIY on Savor Home!!!!! Outstanding!!!! Gonna go get myself some art supplies!!!!! I have been spraying everything with this stuff and looks like my scissors are up next. Thanks for the awesome idea! I cannot remember where my scissors are but because this is such a great and SIMPLE DIY I'm going to go buy some scissors JUST to do this! Thanks for sharing! Simply lovely! Its the littlest details that often make the biggest impact. easy and beautiful!!! Totally doing it. Your photographs are lovely! !